Barbos's Barrier is the boss level of Razor Ridge in the SNES version of Donkey Kong Country 3: Dixie Kong's Double Trouble! In the Game Boy Advance version, it was moved to Pacifica. 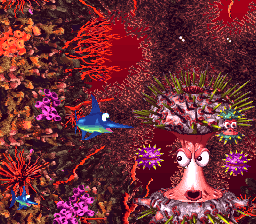 Enguarde the Swordfish faces Barbos here, due to the Kongs being unable to fight underwater. As shown from Razor Ridge's world map, Barbos's Barrier takes place in a lake appearing to have a scowling face on it. The fight takes place in a coral reef. The Kongs start off in an isolated area, which is empty aside from an Enguarde Barrel. Upon entering the barrel, they will transform into Enguarde and automatically enter the battle arena, where Barbos awaits. There is a DK Barrel there in case the player entered the stage with only one Kong. Barbos will continuously spawn Lurchins, which ascend slowly while opening and closing their shells. Enguarde must attack them while their shells are open, which will cause them to bounce off of the walls. The objective is to use these Lurchins to knock away the two pink Lurchins protecting Barbos. Once both of them are gone, Barbos will start opening and closing her shell. Enguarde must stab her weak point while her shell is open. This will cause her to descend into the area below. Here, she will spawn two more pink Lurchins and start shooting Missile Shells. The Missile Shells will chase Enguarde for a few seconds, flash yellow, then launch themselves in a straight line. By manipulating the Missile Shells' trajectory, Enguarde can use them to dispatch the pink Lurchins, once again leaving Barbos vulnerable. After being hit again, Barbos will descend even further. Once Enguarde follows her down, she will rise back upward to block the way out, then start opening and closing her shell while launching spines in many directions. She will launch four volleys of spines before stopping for a few seconds, giving Enguarde an opportunity to attack. This process repeats until Barbos goes down, which requires three hits in addition to the two she takes during the previous phases. Each time she is hit, she speeds up a bit and launches an extra volley of spines before stopping. In the Game Boy Advance version, the Kongs spawn right on top of the Enguarde Barrel instead of next to it. The movement of the Missile Shells is slower and more precise. During the final phase, Barbos launches four volleys of spines regardless of her current health, and she takes one less hit to go down. Barbos drops a Bonus Coin after being defeated. Returning to this stage after completing it and beating Barbos again yields a Bear Coin instead. During the second phase of the fight in the SNES version, it is possible to return to the area where the first phase took place, though this serves no purpose. This is not possible in the GBA version. This page was last edited on February 27, 2019, at 19:45.